when you work in an office, it’s easy to get sucked into the vortex. meetings and email, staring at your computer screen for literally hours on end, perfecting the assprint in your non-ergonomic chair and spilling crumbs onto your keyboard as you clumsily scarf up a sandwich while typing and chewing simultaneously. frustrated and uninspired, i resolved to make a conscious effort—particularly in times of stress or duress—to get up out of my chair and take a walk outside. at a minimum, it would be a few minutes to get some fresh air and clear my head, and if i was lucky, hopefully stumble on something more than simply relief from the daily grind—possibly even inspiration? a couple months ago, some creatives in my office were buzzing about an exhibit at the chicago cultural center, a landmark building that features a revolving schedule of free lectures, films and art exhibits. given its proximity to my building—literally one block away—it was a no-brainer. spending my lunch hour staring at some cool typography would be a welcome diversion from the blinding pain of another powerpoint. 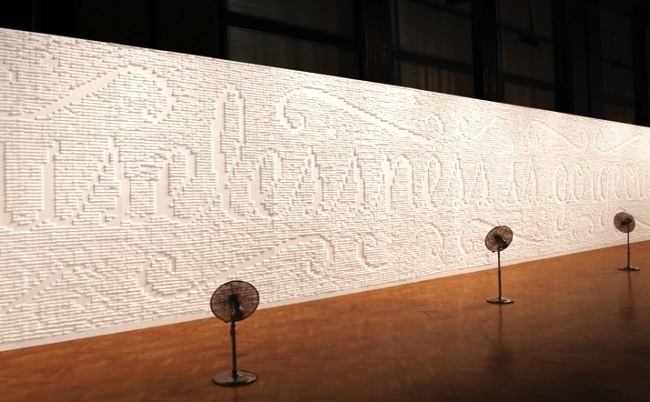 “the happy show” is the culmination of visual artist stefan sagmeister’s 10 year-long exploration of happiness through typography, video, sculpture and interactive installations. his ultimate quest: to discover whether it’s possible to train your mind like you train your body—to be happy. it struck me that “the happy show” was an odd title, suggesting a tv program or movie, a state of being where we passively watch the storyline play out versus actively create an outcome. yet the installations seemed to present an entirely different conclusion altogether. when i got to the exhibit, i was immediately transported. upon entering the huge, open loft, i was enveloped by this sweet, ethereal music. the sound didn’t seem to come from anywhere in particular, but rather filled the space with lightness, air, the perfect backdrop to ponder such existential questions: what does happiness mean? does it vary between men and women? what conditions are required to achieve a state of bliss? what are the barriers? connected to the words was a bicycle that viewers were invited to sit on. as you began to peddle, other phrases would shine brighter, glowing with intensity. "i came up with a repeatable technique to artificially produce a moment of bliss: take a scooter, drive it on a beautiful road with little traffic so i can ride without a helmet and feel the wind in my hair while listening to about a dozen carefully selected songs, music that i don't know well (so it won't have any baggage) but am likely going to like. and very important: there can be no purpose to the drive, just cruising without any goal. this recipe would send shivers down my spine every time. to do something without any goal and without any function has its own beauty. it's the difference between a walk in the park and a commute. it's the difference between art and design." the overall point: happiness doesn’t simply happen to you. you have to work at it. stop to consider the conditions and people who ignite that feeling within you. find the stimulus. or create it. sometimes art can be pretentious or simply too precious—caught up in its own beauty or self-importance. but this exhibit really spoke to me. the universality of the theme. the accessibility of his message. happiness isn’t a cloud, an ethereal thing that floats above, taunting us through objects and things we think we want. it’s a conscious decision. an action. it’s work. simplicity. human connection. relationships over things. amazingly beautiful. i know this statement is going to make my friend jeremy—the purist, resident “artiste,” designer, painter, guardian of the craft—go ballistic. maybe i’m just trying to justify my insta-addiction. but just hear me out and then you can be the judge. my office is literally a stone’s throw away from the art institute of chicago. the museum houses one of the most renowned impressionist collections in the world. from monet to manet, degas to seurat, the halls are lined with gorgeous paintings that capture moments, “impressions.” far from realistic, they express the light, the mood, the feeling, of an instant in time. there’s no denying that these masters were genius in their application of color to canvas. and i wouldn’t dream of implying that a canned set of filters can fill that chasm. but in the end, moments captured and shared are what instagram is all about. some go #hashtag hogwild in the quest for social likes—and surely this fuels the argument for why insta can never be high art. point taken…but to me, it’s not a numbers game. in our digital world, technology has given us endless tools to measure ourselves, add up our value in the form of numbers: likes, followers, tweets, retweets, fuel points, klout scores, calories consumed and burned, and on and on. here’s the thing: i’ve never been a numbers person. yep, even though i was in honors calculus, i’m that girl, who pawns off the check to anyone at the table just so i don’t have to calculate the tip. for me, and i think most of my friends who are passionate about it, instagram is not about quantity at all—but rather the totality of your perspective. consider seurat’s “sunday afternoon on la grande jatte.” in the impressionist wing, the massive canvas pulls you in to one of the most famous scenes painted during the period. seurat pioneered pointillism, the technique in which dots replace brushstrokes, and are meticulously assembled to reveal the larger image. each point on the canvas is finite, yet essential to the entire composition. i don’t care how many dots there are, but i see what he sees. i feel what he is feeling…in the moment. and i gain a glimpse—from this single impression—into his perspective on the bigger picture. instagram is similar. it’s about capturing the mood, the feeling, your impression of a moment in time. but what really matters is those impressions over time. instead of focusing on the number of shots (and yes i have thousands) or likes or shares, one of my favorite things to do is zoom out. look at the broad mosaic of images—monumental and mundane—that make up a life. it’s not about the quantity, but the quality of those moments, and the satisfaction of knowing that i was present in them. that, to me, is art. the art of living. frames. they’re just a set of frames on a wall. so what is it about great design that stirs something inside of us? whether an amazing interior, a fashion collection or a brand, how can simply arranging various elements—be it objects, furniture, words or images—turn ordinary things into visceral experiences, candy for the eyes, inspiration for our lives. sure there’s beauty. but more than that, it’s the possibility. seeing things differently. making connections, and often, random associations. expressing a vision that is truly unique. people often think that either “you’ve got it or you don’t.” but it’s important to remember that it’s not just pure artistry….but also a process. of defining your ethos—at the core, what you stand for. of collecting artifacts that you’re drawn to. of piecing them together to express a cohesive point of view. of making the exterior reflect your interior. designers use moodboards as an essential tool in the creative process. rather than a literal representation, they serve as a centering point, capturing—well, the mood—the tone, color, texture, the feeling of the experience they are striving to create. kelly wearstler, who designed the interior of the viceroy hotel (picture above), started a blog called mylifemyvibe, devoted to offering a glimpse into her process and the "vibe trays" she creates for inspiration. michael kors moodboard for vogue from his fall 2010 collection. donna karan black cashmere perfume, inspired by the black pebbles at her hamptons home. the lesson: inspiration can come from anywhere. it’s just about opening yourself up to it. finding it in unexpected places, time periods, objects, people. you don't have to be a designer to experiment. seek it out. and make it your own. new year. new promises. it’s that time of year again, when we take stock of our lives: reflect on the blessings and isolate the areas for improvement. we resolve to exercise more. eat healthier. save money. give time—to friends, family or whatever it is you neglected over the course of the previous year. for most of us, the annual period of self-reflection is not about reinventing oneself, but rather, just striving to be better. it’s not about perfection, but perspective. perseverance. perpetual discovery. not an end goal, but a process. in reflecting on it, my mind immediately went to florence. go figure: new year, rebirth, the renaissance. but what specifically came to mind were the figures above: “i prigioni” (the prisoners), amazing unfinished sculptures by michelangelo. they sit, unassumingly, in a long hallway of the galleria dell'academia that ultimately leads to the iconic masterpiece, david. while thousands of people each year stampede forward, striving to experience the perfection that is david, many overlook the beauty of a different kind. beauty that stands in contrast to the gorgeous, idealized statues that adorn every other inch of the hall. the prisoners are rough. slabs of carrara marble with human forms struggling to break free. in fact, it was michelangelo’s belief that he didn’t sculpt figures into marble at all: he liberated them out of it. chipping away slowly and artfully to expose the being within. they’re moving. in flux. unresolved, yet full of potential. unfinished works of art. much like us. perfection is an ideal. a goal to strive for. a source of inspiration. but it’s not real life—with its bumps, hard edges, blemishes and barriers. it’s not about the end game, but the process. each year, each day, both successes and failures help us to chip away, to unearth, to unleash what is captive within us. hopefully it’s a little bit stronger. a little bit wiser. a little bit better you.